We are committed to delivering your order to your complete satisfaction with professional, well-trained personnel. Standard Delivery No cost for appliance purchases of $496 or more within our local delivery zones. Kelly’s will drop off items in the original cartons in the garage. If you desire haul away of your appliance with our standard delivery, we require that it be placed in the garage with a clear path for removal. Haul-away fee of $15 per piece. Deluxe Delivery Flat-rate of $49 within our local delivery zones. Kelly’s will move existing items to another location inside the home or haul away (excluding built-in items, unless un-installed) on a one-for-one basis. Kelly’s will unbox and hook-up new, free-standing items. Kelly’s will also haul away cartons and packaging. New hook-ups must be purchased to complete proper installation. 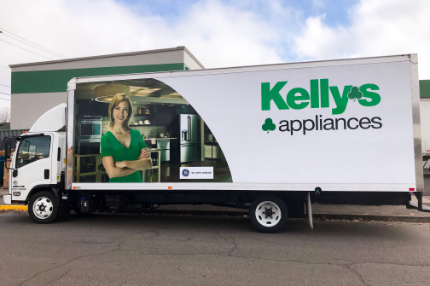 To ensure you have the best delivery and installation experience possible, our delivery professionals are trained to follow a 13-point checklist for every Kelly’s Deluxe Delivery. For more details and our complete delivery policy please download our Home Delivery Guide.